No one wants to break Microsoft’s licensing laws, so keeping track of your Exchange licenses is critical. It may not be obvious due to its name, but this free Microsoft tool can help. metering component. Since you never want to wander outside the terms of your licensing agreement, it’s important to know how many Exchange Server licenses you’re using. The best way to do so is using a free tool from Microsoft called the Assessment and Planning Toolkit. The Microsoft Assessment and Planning Toolkit is primarily designed to be a migration tool. Even so, version 6.5 also includes license metering capabilities for Microsoft server products such as Exchange Server and SQL Server. To begin, download the Microsoft Assessment and Planning toolkit. The installation process is quite simple, but make sure you’ve installed both .Net Framework 3.5 SP1 and .Net Framework 4.0 before doing so. To determine your Exchange license usage, you must first inventory the computers on your network. Open the Microsoft Assessment and Planning Toolkit console and navigate to the Software Usage Tracker tab. Click the Run Inventory link; this launches the Inventory and Assessment wizard. 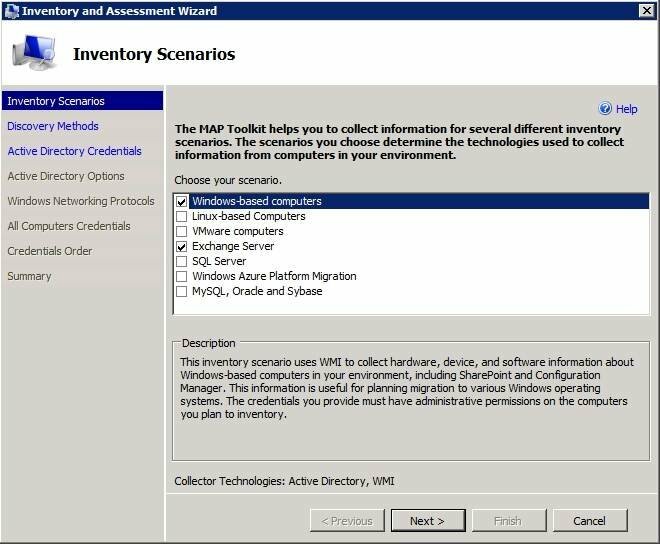 The Inventory and Assessment wizard’s first screen will prompt you to choose your scenario. In other words, you must tell the wizard which Microsoft products you want to inventory. At a minimum, inventory your Windows-based computers and Exchange servers (Figure 1). Figure 1. To start tracking licenses, take inventory of Windows-based computers and Exchange servers. Click Next and you’ll be asked which methods you want to use to discover computers on your network. 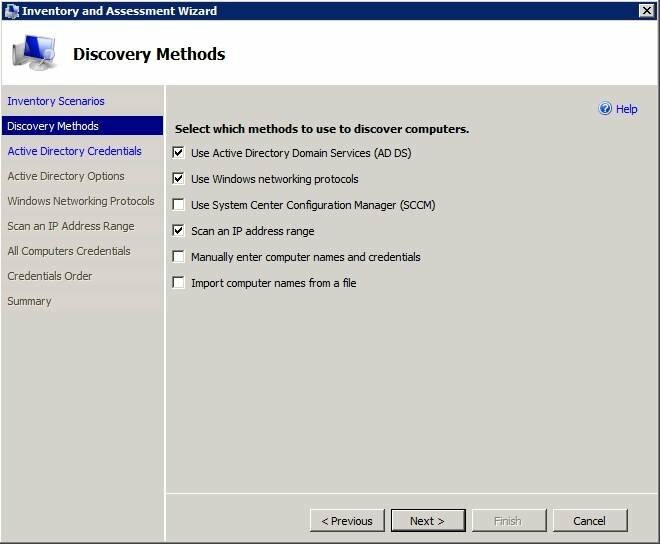 Select the Active Directory Domain Services (AD DS) option as well as the Scan an IP Address Range option. Look at Figure 2 and you will notice that the Use Windows Networking Protocols option is selected by default. Disable this option because it is used primarily to detect Windows NT 4.0 domains. If you leave the option selected, it will cause the wizard to hang later on. Figure 2. Do not check Use Windows Networking Protocol when tracking Exchange licenses. You will now be prompted to enter your domain’s name and to provide a set of credentials with administrative access to Active Directory. The wizard will also prompt you for the IP address range you wish to scan. 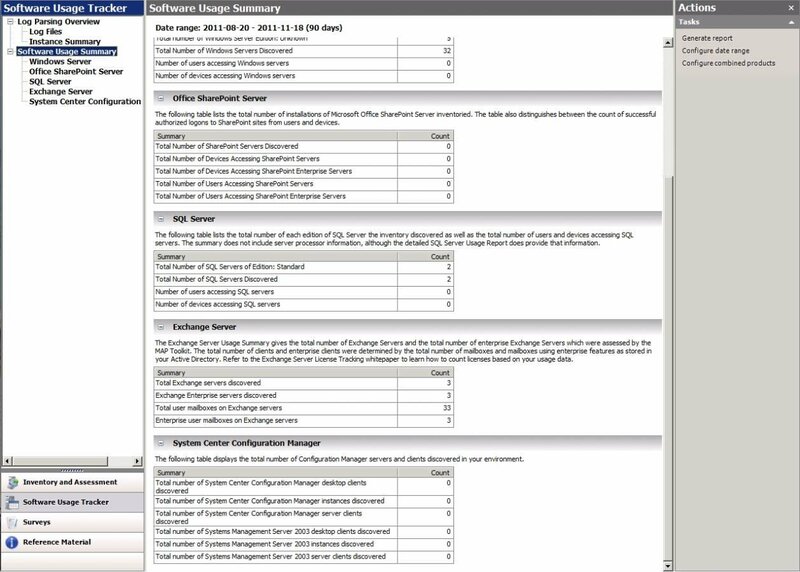 After completing the wizard, the Assessment and Planning Toolkit will query your network based on the criteria you have specified. If you look at Figure 3, you’ll see that this process generated a lot of failures when I ran it against my network. Figure 3. 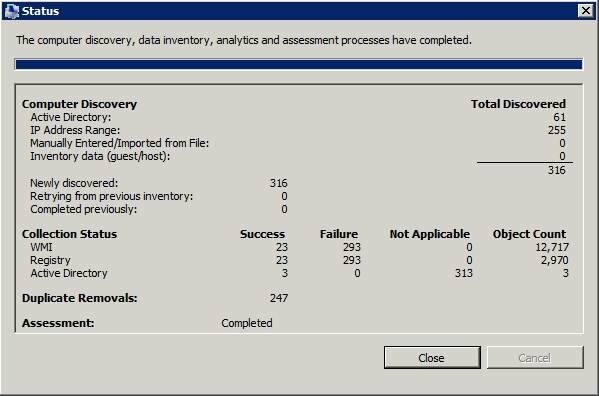 You may receive a series of failures after running the Inventory and Assessment wizard; don’t worry, that’s normal. There are two reasons why these failures occurred in my example. The first reason is that I’m scanning an IP address range and not every address in the range is being used. Second, because this is a lab network, my Active Directory contains references to systems that no longer exist. After collecting your software inventory, you can view the results by clicking the Software Usage Summary container. Opening it, you’ll see a summary detailing the total number of Windows servers as well as the total number of Exchange servers discovered. In Figure 4, you’ll see that the tool provides reporting data for other types of servers, even though we didn’t ask for it. For example, you can see that the tool reports discovering two SQL servers, even though I only inventoried Exchange and Windows servers. Figure 4. The Software Usage Summary screen details the software that has been detected on your network. For more detailed Exchange information, click the Exchange Server container. When you do, the console will display information for each of your Exchange servers. 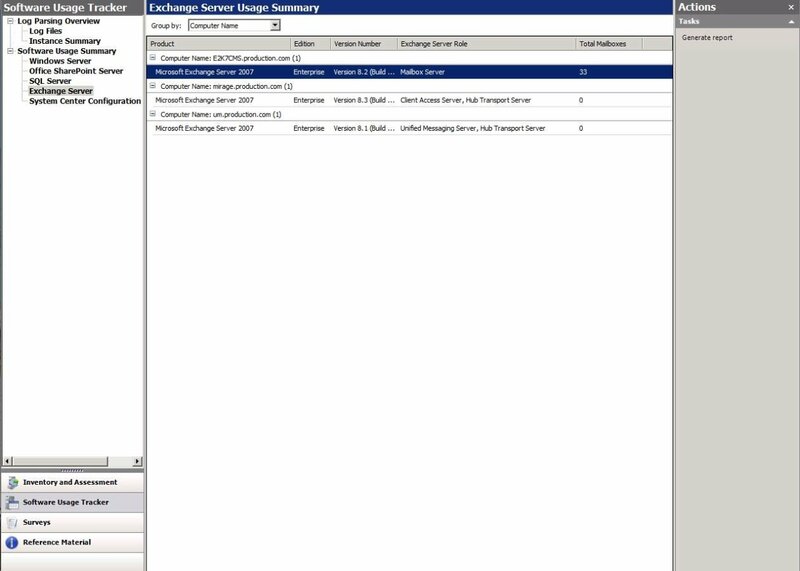 Look at Figure 5 and you’ll see that this screen displays the server name, the Exchange Server version and the number of mailboxes on the server. Figure 5. You can finally view important information about your Exchange Server deployment. There are two interesting things in Figure 5. First, you’ll notice a server named E2K7CMS. This server is actually a clustered mailbox serverwindo. Although there are two servers making up the cluster, the console does not report each individual cluster node. This is important is because the cluster consists of multiple Exchange servers, all of which require multiple Exchange Server licenses, yet the software reports the cluster as if it were a single server. As you can see, the tool is not accurate in clustered environments. The other thing to notice here is the unified messaging server. This server failed about two years ago and I never bothered rebuilding it. Even so, the console still reports the server’s existence because there is a computer account for the server in Active Directory. This shows another inaccuracy. The tool extracts Exchange server inventory information from Active Directory rather than from the Exchange servers. In this example, the tool reports that a license is required for a server that no longer exists. This further goes to show that you must review the results rather than accept them at face value. The last thing to do is create a report based on the information you’ve collected. If you look in the upper-right corner of Figure 5, you’ll notice a Generate Report link. Click this link to create an Excel spreadsheet containing your usage data. You can then find the spreadsheet in your C:\Users\<your username>\Documents\MAP\License Database folder.